Challenge on the Net of Death! Challenge Over the Raging Rapids! Three Times More Thrilling Than Any Tarzan Adventure You've Ever Seen! 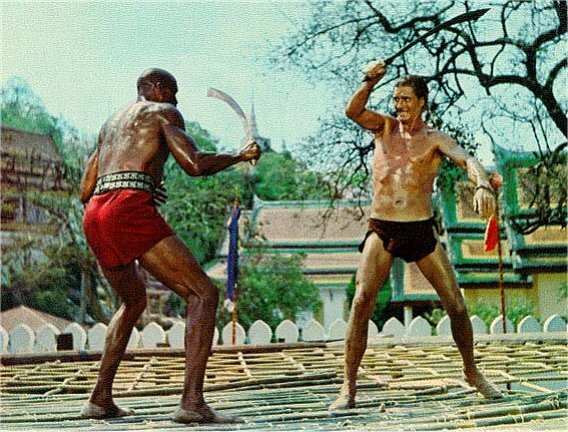 The film features well-staged action sequences, beautiful scenery and a strong supporting cast that includes Woody Strode in what is possibly his most memorable role. The spiritual leader of an Asian country is dying and his evil brother Khan is plotting to prevent Kashi, the youthful heir, from assuming his rightful position. 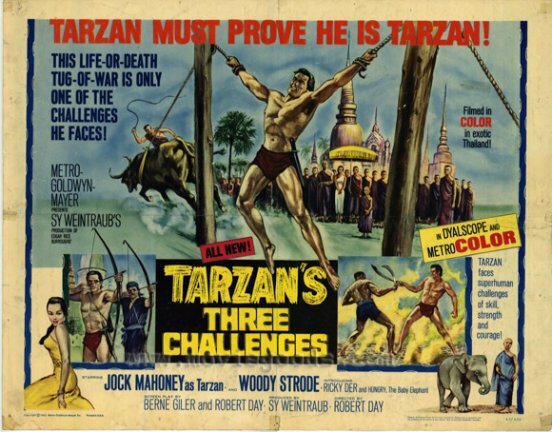 Tarzan is summoned to protect Kashi and must face Khan in three tests of strength. The final test is a sword fight which takes place on a wide-mesh net stretched over cauldrons of boiling oil. Eye candy is provided by majestic temples, spectacular elephant processions and hundreds of dancing girls in beautiful costumes who perform the "dance of the candles." A baby elephant named Hungry provides comic relief. Some scenes where shot in the Thailand's Temple of Buddha's Footprint, the first film ever granted persmission to shoot at this holy site. Crew members and cast removed their shoes and shot in almost total silence. 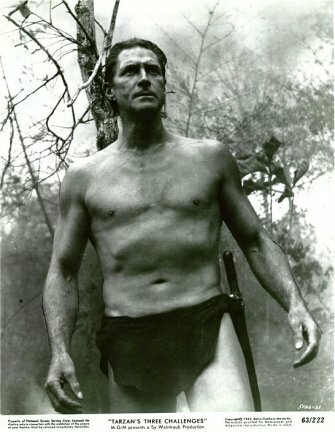 Jock Mahoney who was 44 years old when the film was released became the oldest actor to portray the apeman. 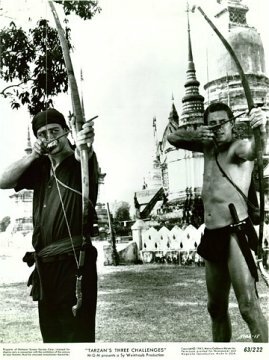 During the filming, Jock Mahoney contracted amoebic dysentery and dengue fever, and finally pneumonia, dropping from 220 to 175 pounds by the time the film finished. 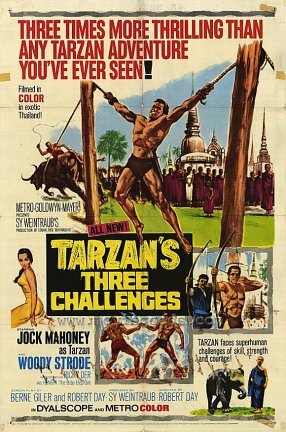 Jock Mahoney played the villain in Tarzan The Magnificent and then on to the leading role in Tarzan Goes To India and Tarzan's Three Challenges and a return to the role of villain in Tarzan's Deadly Silence. Cheetah has been replaced by Hungry the baby elephant for comic relief. The ape cry was not used in this film. 1989: Jock Mahoney (born Jacques Joseph O'Mahoney, February 7, 1919 – December 14, 1989) died of a second stroke in 1989 at the age of 70, two days after being involved in an automobile accident in Bremerton, Washington . His ashes were scattered into the Pacific Ocean. 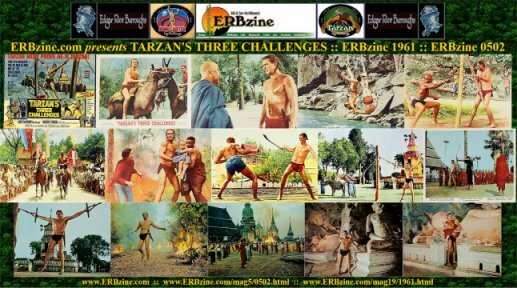 He played Tarzan in two feature films: "Tarzan's Three Challenges" and "Tarzan Goes To India" and was associated in various capacities with several other Tarzan productions. 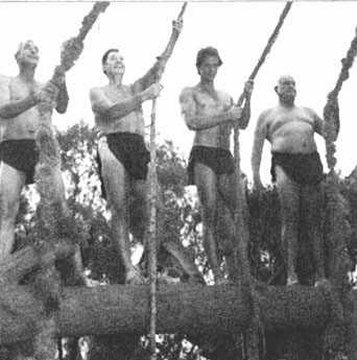 In 1948, he auditioned to play Tarzan after the departure of Johnny Weissmuller, but the role went to Lex Barker. 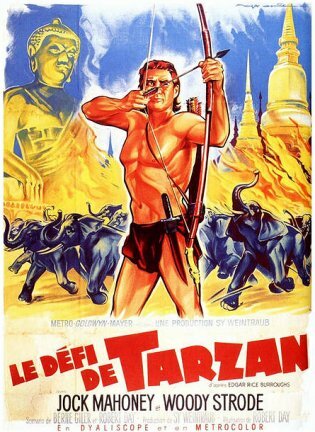 In 1960, Jock appeared as Coy Banton, a villain in Tarzan the Magnificent, starring Gordon Scott. Mahoney's strong presence, work ethic, and lean (6 foot 4 inch, 220 pound) frame impressed producer Sy Weintraub who wanted a "new look" for the fabled apeman. 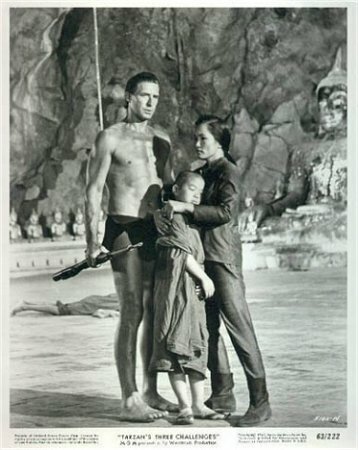 In 1962, Mahoney became the thirteenth actor to portray Tarzan when he appeared in Tarzan Goes to India, shot on location in India. A year later, he again played the role in Tarzan's Three Challenges, shot in Thailand. When this film was released, Mahoney, at 44, became the oldest actor to play the jungle king, surpassing Johnny Weissmuller and P. Dempsey Tabler, a record that still stands. 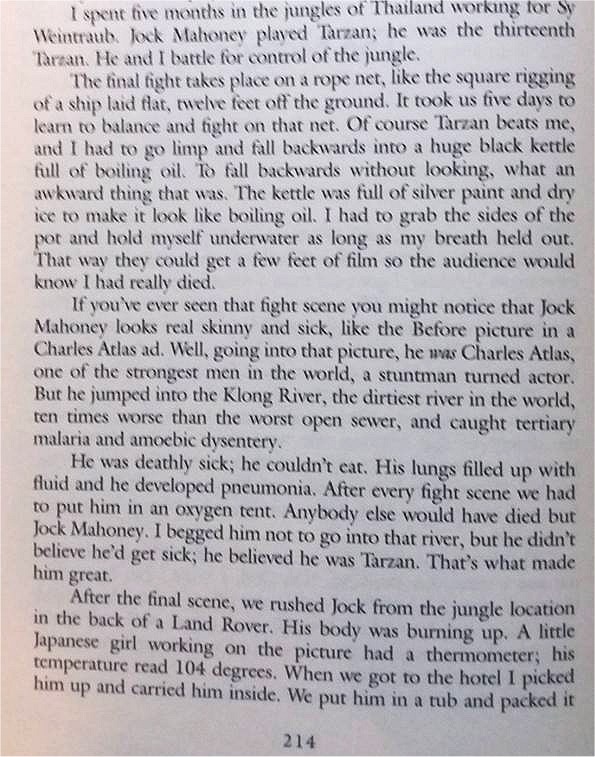 Dysentery and dengue fever plagued Mahoney during the shoot in the Thai jungles, and he plummeted to 175 pounds. It took him a year and a half to regain his health. Owing to his health problems and the fact that producer Weintraub had decided to go for a "younger look" for the apeman, his contract was mutually dissolved. Mahoney made three appearances on the Ron Ely Tarzan series--The Ultimate Weapon (1966), The Deadly Silence (1966) (a two-part episode, later edited into a feature film) and Mask of Rona (1967). 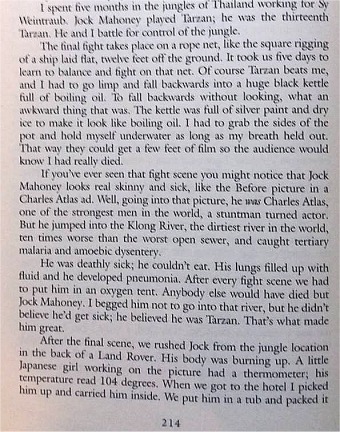 In 1981, Mahoney returned to the Tarzan film series as the stunt coordinator on the John Derek-directed remake of Tarzan, the Ape Man. He was billed as "Jack O'Mahoney".